Walking with Jesus: Day 90: Acts 28:11-22 & Prov. 29:1-9 - What Does It Look Like to Be Wholeheartedly Committed to the Gospel? Day 90: Acts 28:11-22 & Prov. 29:1-9 - What Does It Look Like to Be Wholeheartedly Committed to the Gospel? What Does It Look Like to Be Wholeheartedly Committed to the Gospel? Have you ever known someone who was relentlessly committed to something? I recently saw the movie Hacksaw Ridge, a graphically violent World War 2 movie directed by Mel Gibson. The movie tells the true story of Desmond Doss, a pacifist who volunteered to be a medic. Early in the movie, Doss is absolutely committed to his pacifist convictions, enduring torment in basic training because of his refusal to fire a weapon and his equally strong commitment to serving as an unarmed combat medic. 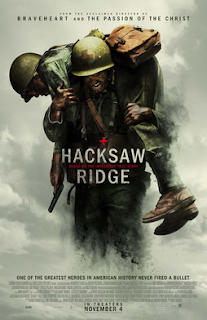 The last part of the movie shows Doss indescribably determined commitment to save the lives of his comrades by getting them off of Hacksaw Ridge, Okinawa, under intense enemy fire. In the end. Doss saved 75 men and was the first American to be awarded the Medal of Honor without ever firing a shot. Today's passage in Acts 28 shows us the Desmond Doss-like determination of the Apostle Paul to take the Gospel to the Jewish people. Paul has spent nearly three years of his life in prison, unjustly accused by Jewish leaders of attacking and undermining the Jewish nation and traditions. Prior to being imprisoned, Paul had been mocked, beaten, harassed, stoned, whipped and utterly rejected again and again by Jewish-led mobs across Asia Minor and Greece. Yet here we see him, after so many years of such intense mistreatment, seeking out the Jewish leaders in Rome. Why? He wants to have an opportunity to tell them about Jesus. Paul's determination and relentless commitment was heroic, even awe-inspiring. Yet he is not the only one in today's passage who shows a wholehearted commitment to the Gospel. Christians in Puteoli hosted Paul and his companions for seven days. After Paul made his way to Rome itself, the Christians from all over Rome traveled to see Paul. These believers practiced hospitality and risked public ridicule or worse to identify with the Gospel and support Paul. You don't need to be a world-traveling apostle in order to be wholly committed to the Gospel. This kind of wholehearted commitment to the Gospel doesn't come from our own human efforts. At the beginning of the book of Acts, Jesus told His disciples, "you will receive power when the Holy Spirit has come upon you, and you will be my witnesses in Jerusalem and in all Judea and Samaria, and to the end of the earth." (Acts 1:8, ESV) As we have walked from chapter 1 to chapter 28, we have seen the Holy Spirit empower His people to take this Gospel from Jerusalem to Rome. The real hero is not Paul or the Christians who hosted him, but the Holy Spirit. Heavenly Father, You alone save us and empower us and use us for Your glory. You alone can give us, by Your Holy Spirit, a wholehearted commitment to the Gospel of Jesus Christ. Thank You for all that You have done for us, are doing in us and will do through us. In Jesus' name, Amen. Heavenly Father, make us teachable and responsive to your reproof. Let us love wisdom and act in justice. Lord, keep us from flattery and from evil. Guard us by Your grace, that we may walk in righteousness before You. We need Your wisdom to guide us and to guard us. In Jesus' name, Amen.